Cozy Cabin Fireplace-WI-FI min. to Bear Mtn. & Summit Mtn. & Golf , Jacuzzi. 2 bedroom 1 bath cabin with wood burning fireplace, cable T.V's, and DVD players in both living room, and 2nd bedroom. There is also WI-FI & home phone. Full kitchen with stove/oven,refrigerator, microwave, blender, toaster, coffee maker, dishes, pots/pans, iron,ironing board and more. Propane B.B.Q and garage for storage. Patio furniture in garage. Bedroom one has comfy queen bed, Bedroom two has a double bed, T.V and DVD player. There is also a queen sofa sleeper in living room great for kids. Maximum occupancy 4-5 and parking for two vehicles. Sal's Reality Check comes with fresh towels, fresh linens, and plenty of cozy blankets. Please no pets and no smoking indoors. Come, Relax and Enjoy this comfy home away from home. Inviting cabin one block from National Forest and Golf Course. Big Bear Zoo and Bear Mountain are 10 minute walk. Very close to Big Bear Lake. So much nature to enjoy and many fun things to do in the village. Explore-adventure-antiquing-golf-fishing-biking-hiking-zip line-eagle watching monthly. So many things to enjoy you'll want to come back often. Good Fun!!!!!! No cancellations 2 weeks prior to check in and 30 days prior to any Holiday reservation. We have a $50.00 cancellation fee. Occupancy is strictly in forced no more then 5. What can I say about this adorable cabin? Glenda took care of me even before I arrived. We had a lovely telephone conversation where she gave me some advice on the area and answered all my questions so very kindly. Their place is just perfect! It was such a wonderful spot. I truly enjoyed our stay. 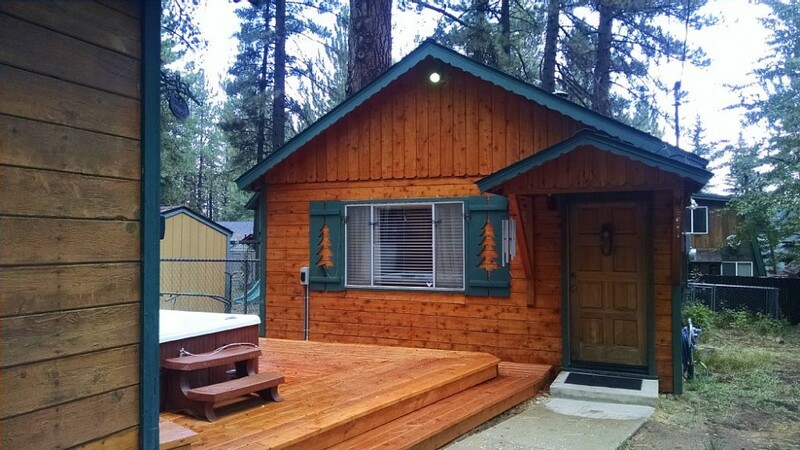 It was a couple weekend and we shared some meals, great jacuzzi time, games and conversation in this well equipped little cabin. It's super cozy, the rooms and nice and warm and the fireplace was a huge hit. We were able to walk up to Bear Mountain which is a huge perk when parking up there is so difficult and gets filled up by 10am. I can't recommend it enough! I look forward to sharing more fun ski and snowboard trips at this adorable spot! The cabin was perfect for our family (including two kids aged 8 and 11)! We all enjoyed how cozy the cabin was and it's great location. The cabin was clean and the washer/dryer and kitchen were very convenient. We walked to the hiking trails that were only a block away. We also loved how close it was to both Bear Mountain and Snow Summit. The best part of it was how accommodating and responsive the owner was in ensuring that we enjoyed our stay. The owners provided outstanding customer service. We will be coming back for sure! Great cabin for myself and child. Great communication from the owner and everything went smoothly. Had everything we needed for a quick weekend getaway, and we enjoyed our stay. This was a perfect stay for us. A last minute trip made easy. Cabin was perfect and clean. Thank you!